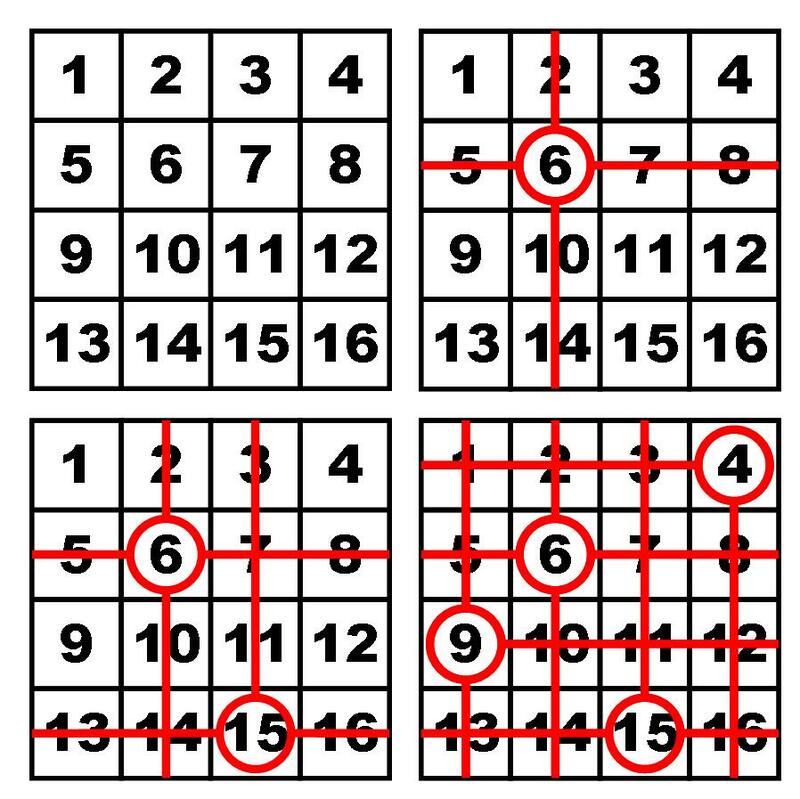 A 4×4 square grid is created on a piece of paper with numbers from 1-16 (see top left hand picture). Spectators choose 4 numbers at random from the grid and the total always equals 34. There was one crucial detail left out from the description of the effect. When the first number is chosen and circled, the remaining numbers on that row and column are crossed out (see the top right picture). There is now only a choice of 9 numbers for the second spectator to choose from. Again the choice is circled and the row and column is crossed out. For the third choice there are only 4 numbers remaining. The final choice isn’t a choice at all as there’s only one number that hasn’t been circled or crossed out. The total of the 4 chosen numbers is 34. Every time! (see the bottom right picture for one possible example)This can be repeated with different choices to show that it always totals 34. There are a number of extensions that can be made for classroom investigations. The obvious extension is working out what the total T would be for different grid sizes (nxn). The table below gives the first six results. There is a general formula that can be set as a task for students to find. The total T is the grid size n multiplied by the central number of the grid. The central number is obvious when odd numbered grid sizes are constructed. However it’s easy to calculate by adding the first and last numbers (n^2) and dividing by two. Hence the term in the brackets of the general equation. 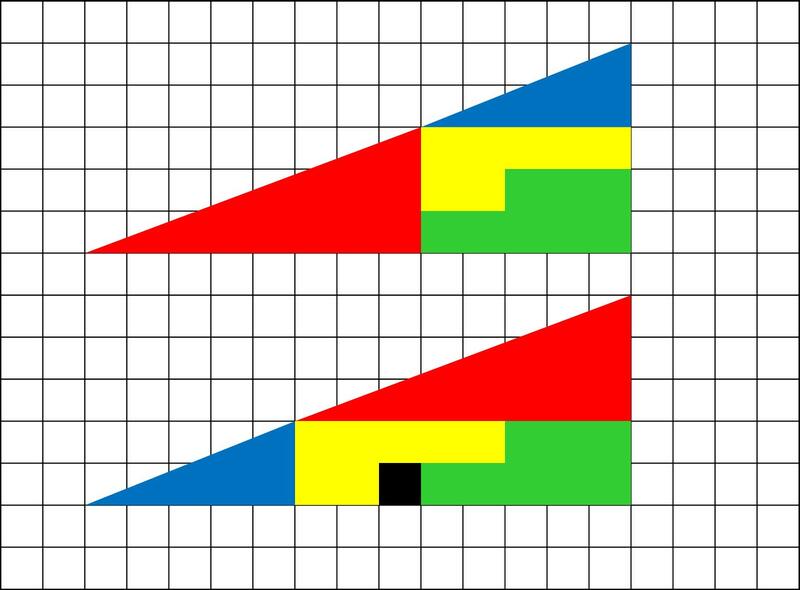 A further investigation could explore the links between this trick and Latin Squares. The magician turns his back whilst the spectator stacks the dice up into a tower. The magician turns to face the audience and the spectator points to any of the dice in the stack (except for the top one because this is too easy). The magician then names the number on the top face of that dice even though it is hidden. When you look at a die the maximum number of faces that you can see is 3. In this trick you are only going to be able to see 2 faces and from that information deduce what all the other faces are. Dice have their faces arranged so that opposing sides always add up to 7 (i.e. 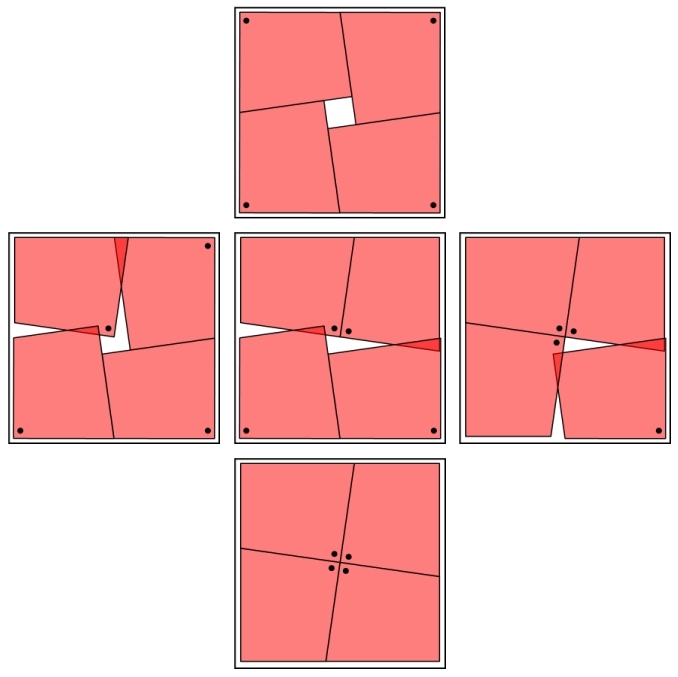 1&6; 2&5; 3&4). The Simple version of Dice towers makes use of this property. 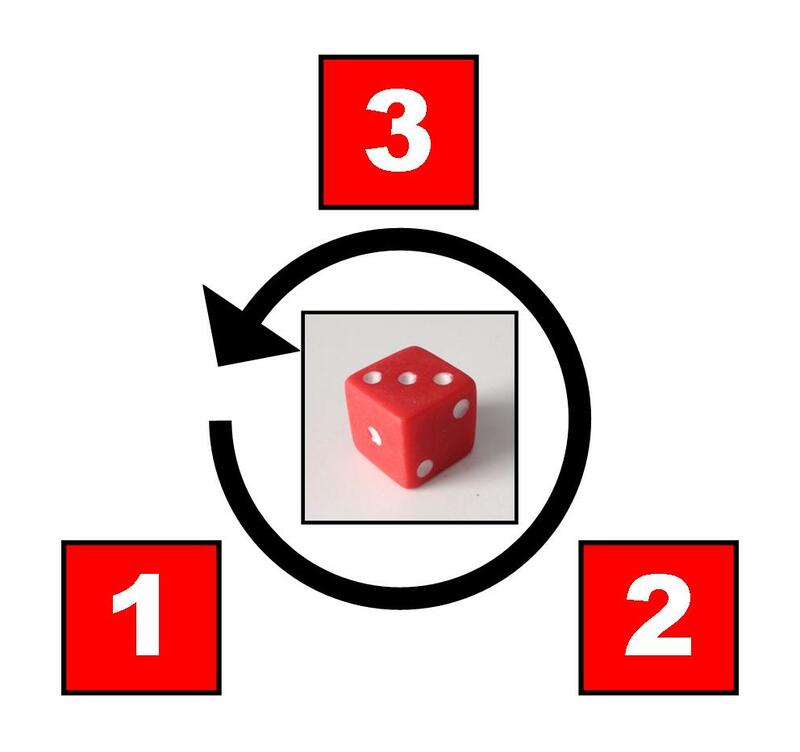 There are two possible arrangements of the numbers on a die that have this property (see the cube nets diagram). What I shall call left- and right-handed. They are mirror images of each other. For what follows I’m using a left handed arrangement which in my experience is more common (the trick can be adapted for right handed dice by flipping all the rules below). I’ve come up with a method to calculate the remaining faces. It’s took a number of iterations to get it to a level where the method is fast and relatively easy to use. I’d love to know if you’ve got a better method or if I can describe it better. There are two cycles you need to be familiar with and these are illustrated in the two diagrams. Taking the 123 cycle as an example… If you see 1 on the left and 2 on the right, you know that 3 must be on top. Equally if you see 3 on the left and 1 on the right, then 2 is on top. This is just a simple rotation of the dice around the common corner. The same principle holds for the 456 cycle. 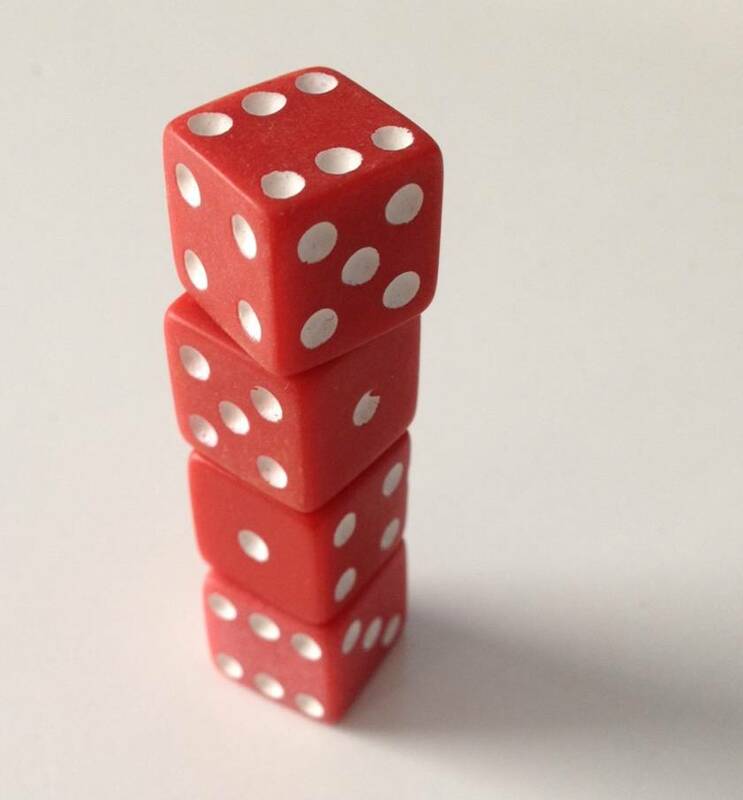 If you see the left and right numbers in reverse order (for example 2 on the left and 1 on the right) then the dice is upside down and 3 will now be on the bottom face. The top number is now 4 because it is on the opposite face. Rule A – If both the two numbers you can see on the left and right faces belong to the 123 or 456 cycle AND the faces are in numerical order then the TOP face will be the remaining number of that cycle. Rule B – If both the two numbers you can see on the left and right faces belong to the 123 or 456 cycle AND the faces are in REVERSE numerical order then the BOTTOM face will be the remaining number of that cycle. The top number can be easily obtained from this information. The question then arises what happens when the numbers on the left and right faces come from the different cycles (for example 1 and 5). You then need to do a little mental gymnastics. 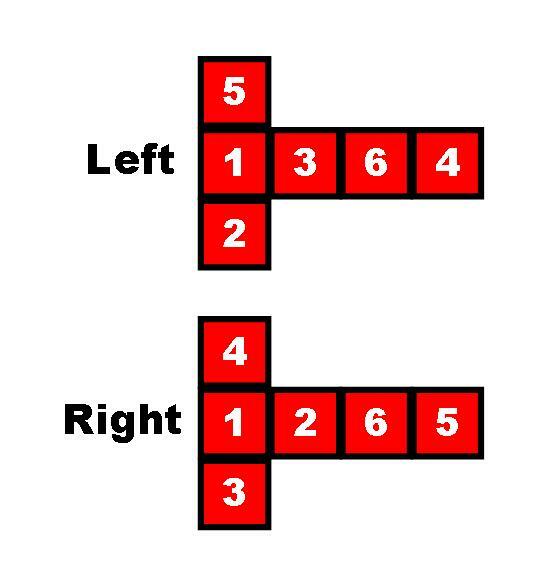 You need to switch in your head one of the numbers for its opposite so that the left and right faces are in reverse numerical order. In our example we have to switch the 1 for a 6 to make them in reverse numerical order. If we switched the 5 for a 2 it would be ascending order. Once we’ve decided which side to switch for its opposite, the final step is easy. As we’ve now got a 5 and 6 from the 456 cycle we know the top face is a 4. Rule C – If both the two numbers you can see on the left and right faces DON’T belong to the 123 or 456 cycle then switch one of the numbers for it’s opposite so that the cycle is in REVERSE numerical order, then the TOP face is the remaining number in that cycle. Here’s another example for rule C: Left = 2; Right = 6. The two numbers are from different cycles so we need to switch one number for it’s opposite. We switch 6 for 1 so that it’s in reverse numerical order. And now we’ve got a 1 and 2 from the 123 cycle and we can deduce the top number is a 3. A spectator stacks up a tower of dice whilst the magician’s back is turned away. The magician turns around and immediately names a number out loud. This number is the total of all the hidden faces (i.e. the top and bottom faces except for the very top one). Dice (I usually use 4 dice). The bigger the dice the better as it makes it very visual. 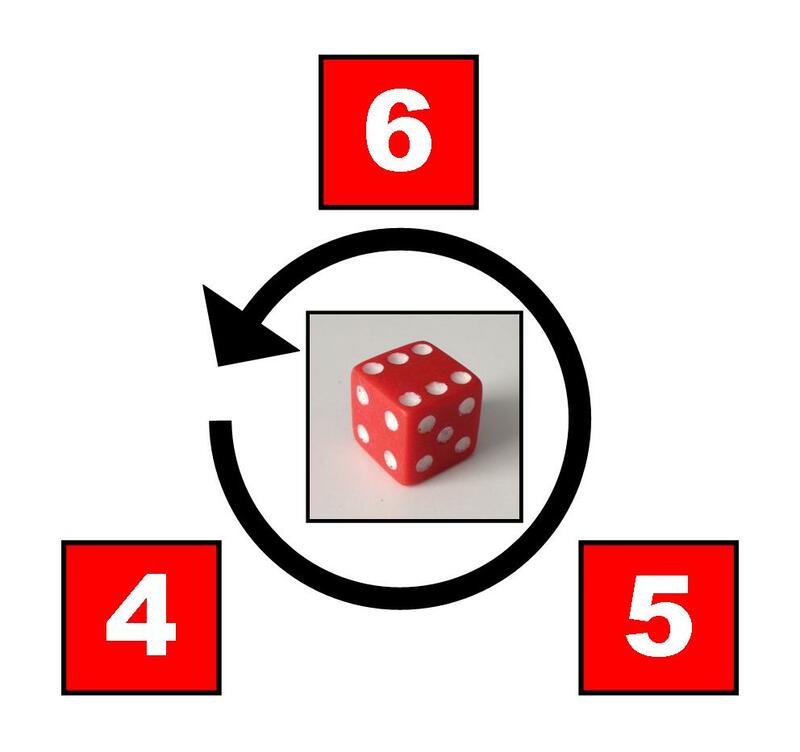 The principle behind the magic is that opposite faces of a dice total 7. eg 1&6; 2&5; 3&4. For a tower you then know the total sum of ALL the top and bottom faces will equal 7 times the number of dice in the tower. So for the example in the photo the total sum is 28. To calculate the total sum of the hidden faces you need to do a very simple calculation when you turn around to face the audience. First look at the number on the very top and then subtract that from the number you obtained earlier. In the photo example you have to do 28-6=22.